This review first appeared in the November 23, 2006 issue of the North County Times. Inhabiting much of the same musical territory as the Blasters, Dave Edmunds, the Beat Farmers and Big Sandy, Buzz Campbell & Hot Rod Lincoln play a hard-charging yet swinging brand of countrified roots rock. 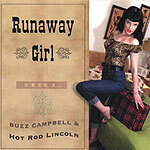 Built around the oh-so-smooth vocals of Campbell and almost a dozen solid, original songs (plus a handful of covers), the band's new album, "Runaway Girl," is top-to-bottom listening pleasure. For only having a trio  Campbell plays guitar in addition to singing, while Ty Cox plays drums and Tim Butler bass, with both providing harmony vocals  the band gets a very big, full sound. Credit the band's stellar musicianship or their solid arrangements  whatever it is, the band sounds more like a five-piece than three. But it comes down to the songs, as any album does in the end. And on this score, Campbell shows he's got a lot to contribute, having written or co-written 11 of the 15 tracks here. There's a classic honky tonk feel to many of Campbell's songs  "Blue" belongs on a jukebox at some greasy-spoon in a small town somewhere on the Great Plains or Deep South. "Too Drunk to Drive" hearkens back to the uptempo bad-boy country of the 1970s, while "Runaway Girl" recalls the spirit of Buddy Holly or Edmunds' late '70s solo projects. And "Invasion From Mars" is a tight little tribute to Billy Lee Riley's classic if forgotten "Flying Saucer Rock 'n' Roll." All of it is played with infectious joy and pure abandon: It's the perfect distillation of the rock 'n' roll spirit.